Looking for a new single speed hub for my Jabberwocky to replace my aging geared King universal disc hub. This hub over ten years old is starting to require almost monthly adjustment and maintenance. I've been running the HD axle with fun bolts and it has only seen single speed duty for the last year. 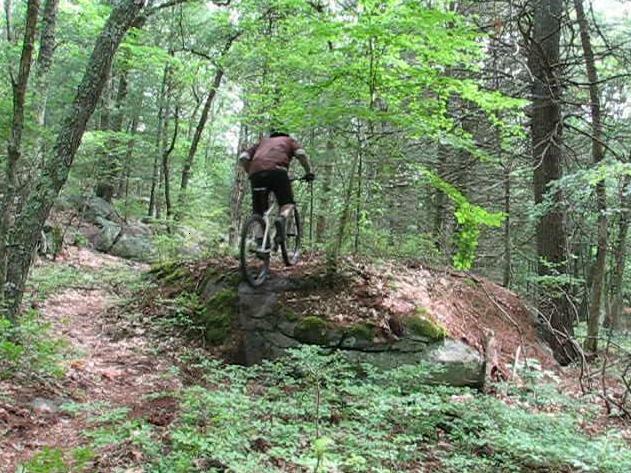 It has survived countless drops, many lift service days at Highland, Diablo, Killington and Plattekill, wet snowy NE winters and has been a part of my main trail bikes for most of those10 years. Maybe it has been abused too much but it seems like I have to adjust the bearing preload, clean and lube the drive mech at least once a month. It has been to King for service about 4 years ago and I have the LBS go completely through it once a year. It has never needed any parts, bearings have never needed replacing, has never skipped and love the solid ring drive engagement. Finally to the question. Do the new King single speed hubs require less adjustment and maintenance? I going to have a new 29er wheel built and have searched these forums for the strongest, most reliable single speed hub and have narrowed it down to King, DT 240 and I9. 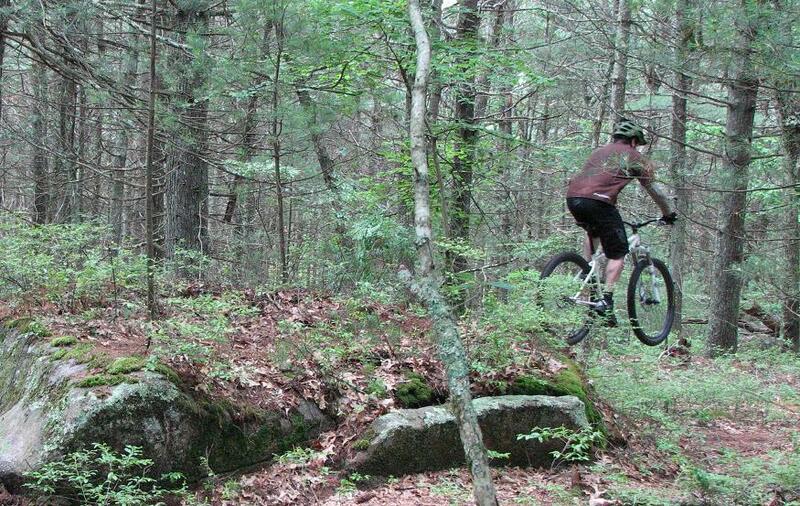 I'm not sure how well the DT240 will handle abusive riding and drops up to 5'. They seem to roll great, require little maintenance, easy to service and with the 36 pt upgrade would meet my minimum POE requirements. How strong are these hubs? They seem to be more of a XC type hub. I9s are expensive and was quoted $790 for rear only single speed mated to Stans Flow. The aluminum spokes are suppose to build a very stiff wheel and I'm not sure that this would be the best choice for a hardtail, thinking that the vertical compliance of a conventional build may be better suited to my style of riding. Can a wheel be too stiff? King is in the lead and can have built to a flow rim for considerably less. The ring drive has never failed me and have great customer service. I've also considered Hope and Hadley. I've never owned a Hope rear hub but have had good luck with their front. I've read that the pawl springs tend to break and there's probably no good time for that to happen. I have 3 Hadley hubs, one on my VP Free, one on my 4X and a 72 pt built to a 29 flow which has seen single speed duty on the Jabberwocky. The Hadleys work great on my geared bikes but set up as a single speed I can hear and feel it skip when really powering up a climb. This hub is a fairly new replacement for an older 108pt hub that had self destructed in the middle of a ride. Fortunately it did not happens on a drop or other technical situation of consequence and is probably the reason I'm leaning toward the ring drive or star ratchet designs. I would like to add that Hadley has great customer service. Sorry for the long winded post but I'd like to buy once and usally live with my choice for many years. Any thoughts, opinions or pictures of your hubs would be appriciated. Have you thought about a freewheel specific hub, such as a Phil Wood, Paul, White Industries or Chub, mated with a White Industries Freewheel, which come in 36 POE or 72 POE for the trials version (only in 18 teeth). Bomb proof hubs and freewheels. I have thought about a freewheel setup but don't have any experience with them. I've read in some trials forums that even the White freewheels can skip and fail. The Phill Wood looks like they offer larger and wider flange spacing which should make for a nice strong wheel, but they're heavy. I realize that I can swap out the front chainring to change gearing but I already own a couple of King cogs. The 18 that comes with the King hub would give me enough range to cover all the riding in my area. Are the White freewheels stronger and more reliable than the King ring drive, DT's star ratchet or the I9 6 pawl setup? The Paul Hubs are the lightest out of those I mentioned. 290g. But if you're doing 5' drops, probably best not look for the lightest. Sorry, but I can't tell you which drive mech would be more reliable. But the White hub (with a cheap ACS freewheel) I've got had been service free for 2 years solid ss use (I don't currently use it). 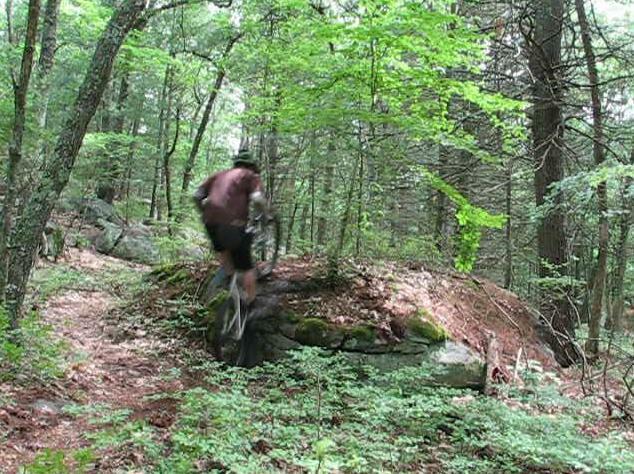 I have a set, and will never ride any other hubs on a mountain bike, ever. Patch, with all your hub exprience and mad skillz, I'd be more inclined to ask for your advice than give you mine. PERSONALLY... I won't own a screw-on freewheel again... ever. I don't change my ratio often, but whenever I do, it's much easier to switch a cassette cog. I'm not saying a screw-on freewheel / hub system is weaker, but I have in fact torn a hub in half (threaded portion broke off inside the freewheel body). I have several sets of King hubs including SS and find them long lived and easy to maintain. But I never do 5' drops. 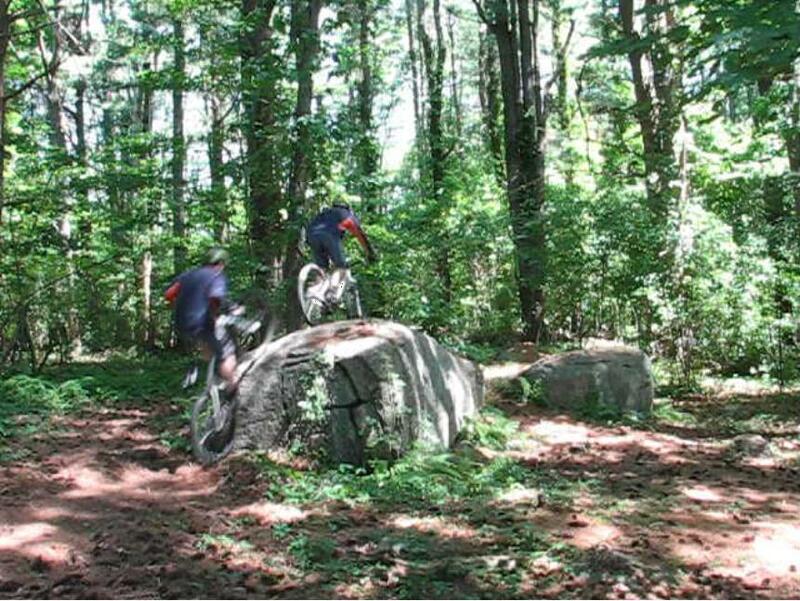 No mad skillz, just like to ride up, over and off things and would hate to have a failure once fully committed. I've been riding the King for so long just wondering if there is something newer, stronger , faster and more reliable. All my other hubs are fine for the geared bikes but still fairly new at this SS thing and have never owner a dedicated SS hub. it seems like I have to adjust the bearing preload ... at least once a month. It has been to King for service about 4 years ago and I have the LBS go completely through it once a year. It has never needed any parts, bearings have never needed replacing, has never skipped and love the solid ring drive engagement..
those two statements don't quite match to me... I would try replacing the bearings and checking for wear on the adjustment hardware. I've used Hope, DT and XTR (converted with spacers) for singlespeeding with good luck. I think both the DT and Hope would serve you well and maintenance is really easy with both - you can basically pull the freehub off and clean/lube them at will. I agree with Sparticus that a freehub/cog system is better than a screw-on freewheel. Not because of any weakness with the White/Paul equipment - I respect these manufacturers tons. It's just a lot easier to change cogs/gear ratios in the former system. I doubt many folks own three or four White freewheels and change them based on the terrain, ride or current fitness level, which I and my ss'ing friends often do. The thing I would suggest you consider for the riding you do is axle strength as much as bearings/pawls. I'd recommend a system that allows you to put a beefy axle and strong nuts/bolts. The DT upgrade to their RWS thru-bolt system is easy and not too expensive. I've found the Hope bolts not great in terms of strongly binding the axle, especially if you are using horizontal dropouts. I don't want to come off as the seniorspeed hadley fan boy but I do like their stuff. I run them on my dh, nomad, and on my 26" ss. Like the King hubs, I think that as long as you do occasional maintenance on them, they run really well. I'm running a 240 on my 29" ss now. Nice hub. Really simple to service. I'm 185lbs and while I'm not doing any kind of drops on my ss, I do like to go fast. Which is my lame attempt to say that I don't baby the hub or spend any time thinking/worrying about it -- and it hasn't given me any reason to do so (yet). I also did the star ratchet upgrade and it was super simple to do -- took all of 2-3 minutes. And +1 on the rad/mad skillz...that's pretty cool. Every time I send the hub/wheel for service either to King or LBS they tell me the bearings are in great shape and didn't need to be replaced. Maybe too much lube? I run the HD Fun Bolts bolts on the King and the 10mm thru axle on the Hadleys and have never had a failure of either one. Does anyone know how strong the axle is on th DT240s or their ratcheting thru axle? Just speculating, but maybe it's not so much wear of the bearings as wear on the adjustable elements of the axle assembly itself that are slightly out of spec. Maybe treat that trusty King to a new axle and end caps/adjusters? DT 240 or King SS specific hub should be the way to go. I have the 240 on my Jabber, and I am 260lbs, and i has been flawless. I even have the 36t step up installed as well. Voodoo - The HD axle is one piece and appears to be in good condition. I have wondered if the hub may have been streched due to over tensioning during one or more of the 4 different rims its seen over the years. I've thought of shipping it off to King for a new shell and now maybe an axle, but factoring in the cost of parts and new build I will keep this for a spare to my new single speed wheel. Enresto - I just read the Twenty Nine Inches wheel build article where they used a White ENO hub. Very nice looking hub and the builder commented "White Industries hubs are just eye candy, all polished and such. Smooth too. Man, in the workstand those hubs spin like there is no tomorrow." Do freewheel hub tend to roll smoother, better? I can't tell form the pictures on the WI site but are the axle and axle bolts both serrated where they contact the drop out? Lastly, does the hub ever develop any play? I notice the use of various numbers of thin washer between the bearing and axle. This hub look solid. Last edited by Patch; 06-15-2010 at 03:19 AM. Thanks everyone for all the input. I finally made a decision and have ordered a King SS mated to Stans Flow from Dave's SpeedDream as I've only heard great things about his wheels. Pewter hub, black spoke and rim but it appears there will be some waiting as the only color available from Chris King is black. After reading this I think its amazing on the quality of the King hub. 10 years of all kinds of abuse and it still spins, maybe not as well as in the past but that is one bomb hub. I have been very happy with my Hopes, but they are a little noisy. I definitely recommend them. Drbbt - almost puled the trigger on the Hope and if the King is going to take a couple of months I may may change my mind. Are the Hope bolt washers serrated so that it grips on both sides of the dropout? 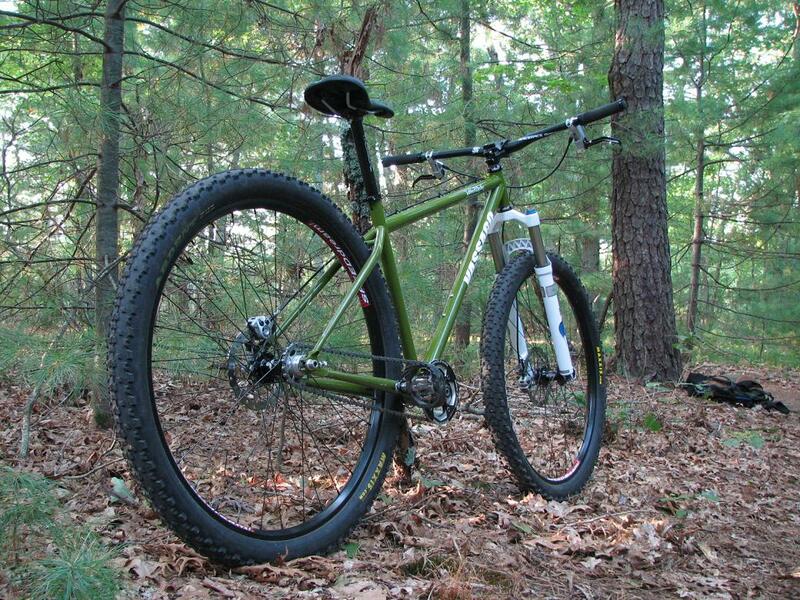 Anyone have any pics of King Pewter or Hope singlespeed hubs? Are the Hope bolt washers serrated so that it grips on both sides of the dropout? I have a SS bolt-on Hope and love it, but mine currently has 6 gears on it. Hope bolt washers have alot o' bite! I finally made a decision and have ordered a King SS mated to Stans Flow from Dave's SpeedDream as I've only heard great things about his wheels. Pewter hub, black spoke and rim but it appears there will be some waiting as the only color available from Chris King is black. I have had three sets of Dave's wheels over the years and they are fantastic. Listen to his advice, he knows what he is talking about. The answer to your question is no, there is nothing stronger, faster or more reliable than a King. Are you debating the King comment? What other hub has 72 actual points of engagement (not 4 or 6 prawls), five bearings and supports 800 ft/lbs of torque? If I had more money, I'd get a King hub. Now happily using Hope. The loudness does not bother me. oh i'm sorry, i should've quoted your post so that it's easier for you to comprehend. i thought it was enough to immediately follow your post. i apologize for the confusion. unless you can provide your source for your 800lb-ft capacity, and reputable data on that of the competitors, your number is completely pointless and useless. even if your number is true, a wheelset is only as strong as its spokes, in terms of torque capacity. i'd like to see a wheelset experience 800lb-ft of torque without failing. Same here, I've got used to the loudness (which isn't that loud). I can't comment on the bolt's effectiveness though, as I've converted mine to QR, as my frame (Singular Hummingbird) has vertical dropouts and an EBB. That number comes from King's website, but I have never tried it out. The spokes should support that amount of weight (a single 14g DT will support 1000+lbs according to BBI) but you are right, it is a rediculous amount of stress to suppose a wheel will survive or even have placed on it. The 1/3 horsepower (300 watts) that a really strong rider can produce is not going to do that and even a pretty serious car wreck wouldn't really cause it. Sorry it took me forever to read this post. Sealed bearings - they are sold. I have, though, gone through a set of bearings because in the winter I ride in deplorable, salty conditions. Bearings are a snap to replace, but yes, the hub is rock solid and awesome in all respects. My oldest hub (going on 7 years now) is the one I had to replace the bearings on. Only once. No play, and still spins like a DJ. In my opinion the ring drive used by king, or the ratchet drive used by dt swiss are superior to pawl actuated systems. Some pawl systems may be better than others, but you're still depending on x number of relatively thin pawls. Obviously the pawl system works since 99+% of the hubs on the market use them, I just don't think they're the 'best' option for hard mountain biking. I've searched and searched for a hub that has better reliability/durability/engagement/etc than the kings. For the weight I haven't found anything that compares. I just built my 3rd wheelset with kings, even though intially I wanted to try something different just because I've already ridden kings and wanted try something new for the fun of it. After the months of crunching numbers and over analyzing everything I ended up with kings again. I likely would've gone with 240s, as I was planning initially, but due to the lighter/less stiff rims that take a slightly lower tension than other rims (stans 355) I didn't feel too comfortable using the 240s with the lower and different sized flanges. From what I gathered they'll work, but they likely won't build as strong of a wheel since tension is so different from one side to the other. Well I finaly received my new wheel and it's not a King. I've been calling King since the end of May to find when pewter, silver or mango SS hubs will be available and they have no ETA. Also had the builder try and and received the same response. I decided to try something new and went with a black Hope SS hub. It was considerably less money and I'll be able to ride it this summer. If I was going to pay the premium for the King I wanted to at least get a color I wanted. Initial impressions are positive and will hold off on a more detailed review as I only have 5 good rides on this wheel. The wheel is very stiff and feels solid in the drop outs. The 8mm bolts are look stronger than King fun bolts and with the washer being serrated, there has been no unwanted movement in dropout like I've experience with the Hadley 10mm bolt. This hub is louder than the King & Hadley but with a different type of sound, you can almost feel the pawls engage. Time will tell if it becomes annoying. On the trail I can't realy notice a difference between 48 vs 72 POE. Anything with at least 36 works for me. The engagement is really solid and have not experienced any skips, pops or other noises that I was getting when putting everything I've got into it. I should've taken some pics when new but decided I'd rather ride. Will post some once cleaned up a litte. Here's a ride pic for now. I'm curious as to how the freehub mechanism holds up. I have the dt-swiss 240s hubs in my xr1540 wheelset. Almost 5 years of single speed abuse and i have never even taken them apart. If they were in bed and eating cookies, i'm afraid i'd have to let it slide. Hub is working flawlessly. Feels completly broken in, smooth, strong, positive engagement, no bearing play and no maintenance. Had Dave build up a new front 15mm wheel with matching Pro II and installed new fork lowers, bike feels nice and solid on both ends, best its ever felt. Also upgraded the frame this week to the new army green, installed RF Atlas stem and low rise FR bar [replaced Thomson x4 & Easton Havoc 28" medium rise]. I was originally going to trim the bar from 31" to 29" but after trying it at full length trimmed it down to 30", feels real good in corners! Last edited by Patch; 08-24-2010 at 04:23 AM. Also upgraded the frame this week to the new army green and installed RF Atlas stem and low rise FR bar [replaced Thomson x4 & Easton Havoc 28" medium rise]. I was originally going to trim the bar from 31" to 29" but after trying it at full length trimmed it down to 30", feels real good in corners! Nice rig. What cog and spacer is that? I like the lightening holes in the cog - looks sharp! I think you made a good choice going geared freehub with a single cog and spacer. My philosophy is that it's easier to sell a wheelset with a geared freehub than it is with a SS specific hub. 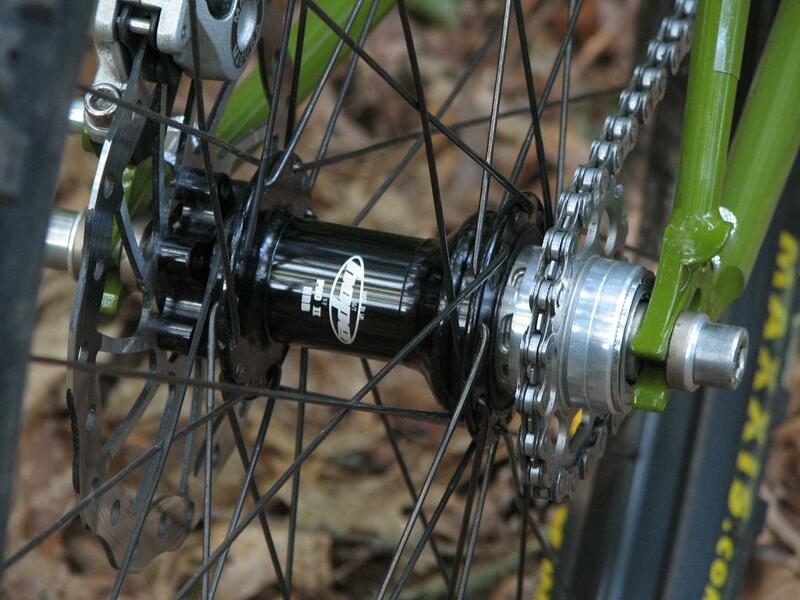 That's a Hope Pro II single speed trials hub with factory spacers. The cog is Chris King. Already have two other geared 29er rear wheels, one King and the other is a Hadley.